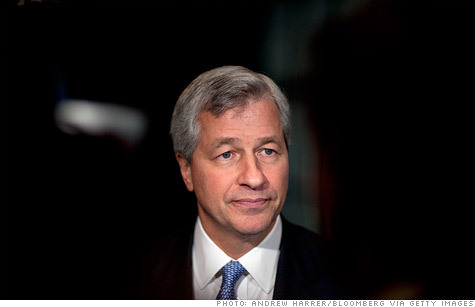 CEO Jamie Dimon revealed Thursday that JPMorgan had suffered a $2 billion trading loss. NEW YORK (CNNMoney) -- The closing bell brought no relief for JPMorgan Chase on Friday, as a major credit rating agency moved to downgrade its debt almost exactly 24 hours after the bank revealed a $2 billion trading loss. Fitch Ratings downgraded both JPMorgan's short-term and long-term debt, with the latter falling to A+ from AA-. The bank, the country's largest by assets, was also placed on ratings watch negative. Fitch said it views the $2 billion loss as "manageable" but added that "the magnitude of the loss and ongoing nature of these positions implies a lack of liquidity." "It also raises questions regarding JPM's risk appetite, risk management framework, practices and oversight," the agency said. Separately, Standard & Poor's revised their rating on JPMorgan's debt from stable to negative, a signal that a downgrade is more likely to occur in the future. The ratings actions are a reaction to news that came via a hastily arranged conference call after the market close on Thursday, when CEO Jamie Dimon revealed that the bank had suffered $2 billion in losses over the past six weeks. The unit that suffered the losses is part of the bank's so-called corporate unit, and had been making trades designed to hedge against risk. Net losses, after factoring in other securities gains, are expected to exceed $800 million by the end of the second quarter. And losses could increase depending on market conditions and the bank's actions moving forward. The unit had been expected to post a net gain of $200 million. Shares of JPMorgan (JPM, Fortune 500), which dropped 9% during the day Friday, continued to slide after hours, with shares falling another 1%.